Achtung baby! I’m on the first of my trips in 2017, and have arrived in Berlin! 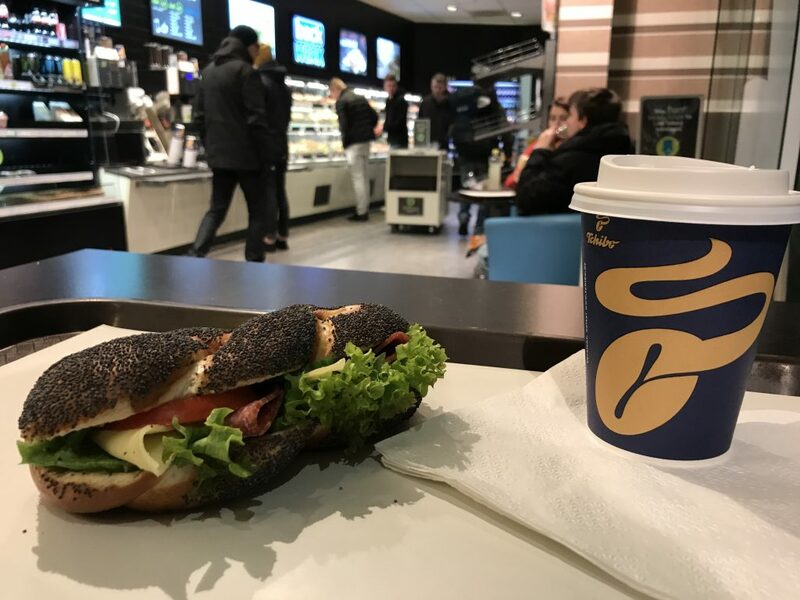 I’ve been in Germany a grand total of three times – once when I was a youngster, a visit to Munich when I worked for Sainsbury’s (all I remember is drinking lots of beer) and a pit stop at Frankfurt Airport en route to Japan a couple of years ago. So when Ryanair (hmmm) launched direct flights to Berlin from Belfast, I decided the German capital would be next on my list of cities to visit. So on Thursday morning I had a rude awakening at 2.30am when my alarm clock went off (well not really an awakening – even though I’d gone to bed at 8.30pm, I just couldn’t seem to get to sleep.) 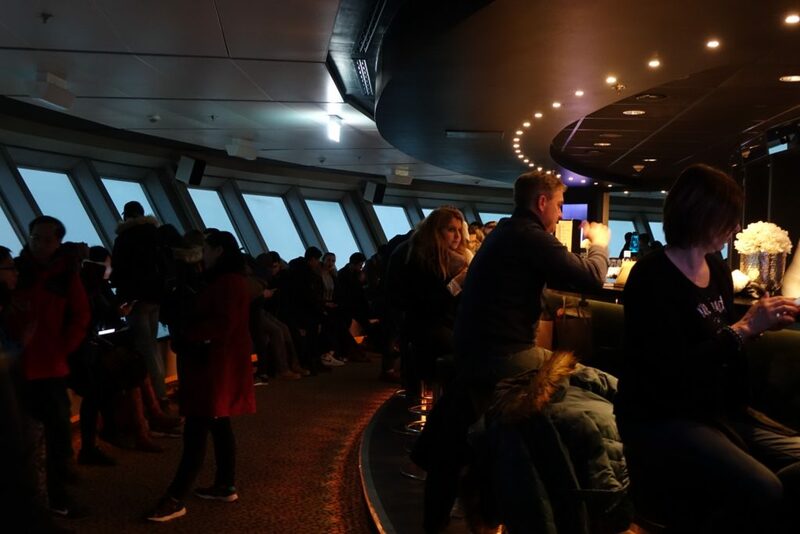 I yanked myself out of bed, and was soon sitting on the plane passing over the Irish and North seas on my way to what’s perhaps Europe’s most ‘edgy’ capital city. The flight was ok for what it was. 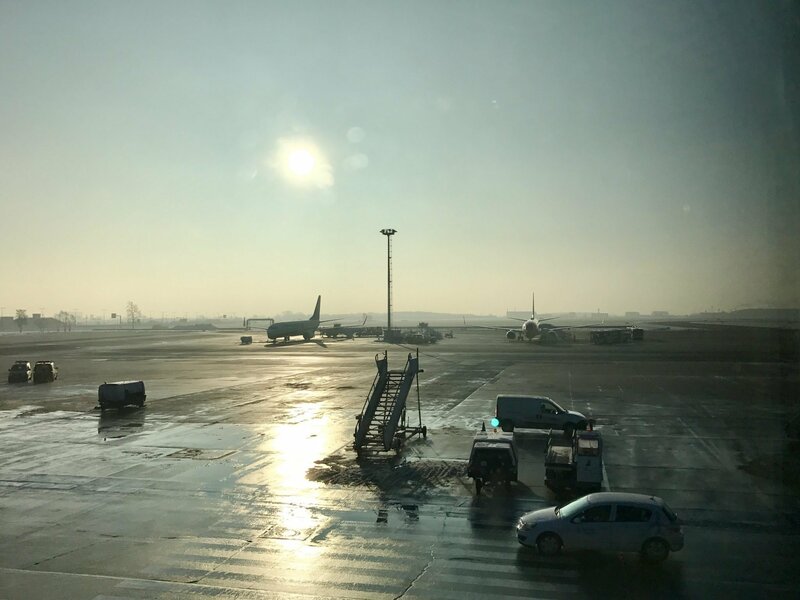 My seat felt really narrow (and I don’t think I’m big) – but a couple of Netflix shows I’d downloaded helped pass the two hours, and soon we were touching down at Berlin’s Schönefeld airport. It felt a bit chilly as I stepped off the plane, but I was wrapped up warm. Just as I arrived at the baggage belt, my bag appeared, and I was ready to go! Or so I thought! There’s a number of different public transport cards available for tourists when visiting Berlin, offering various discounts at attractions. I did a quick calculation and worked out the one that would make most sense for me was the Berlin Welcome Card. I’d ordered it online, so just had to pick it up from the tourist information desk at the airport. Or so I thought. When I handed over the booking confirmation I’d printed out, I was told that wasn’t sufficient – I needed to show a copy of the voucher I’d been e-mailed. So I showed that on my ‘phone, but no – it had to be a hard copy. Man! I headed to an Internet cafe a couple of doors down from the tourist information office, and then tried to log into my e-mail. I say try to log on because there was no @ sign on the keyboard. A poster on the wall said “To Type @ press ALT+G”. I tried that, no joy. Eventually I worked out to type into Google “What does an at sign look like” then copy and paste it. Then when putting in my password I realised that German keyboards are laid out differently from British ones – the letters are in different places. Only weirdly the letters that appeared on screen when I pressed a key on this computer bore no relation to what was printed on the keys either. Anyway to cut a very frustrating half hour short, I eventually printed off the voucher, and joined a by now ten minute long queue at the tourist information desk. Printing the voucher had cost me four euros. Probably what my Berlin Welcome Card would save me over the next six days! 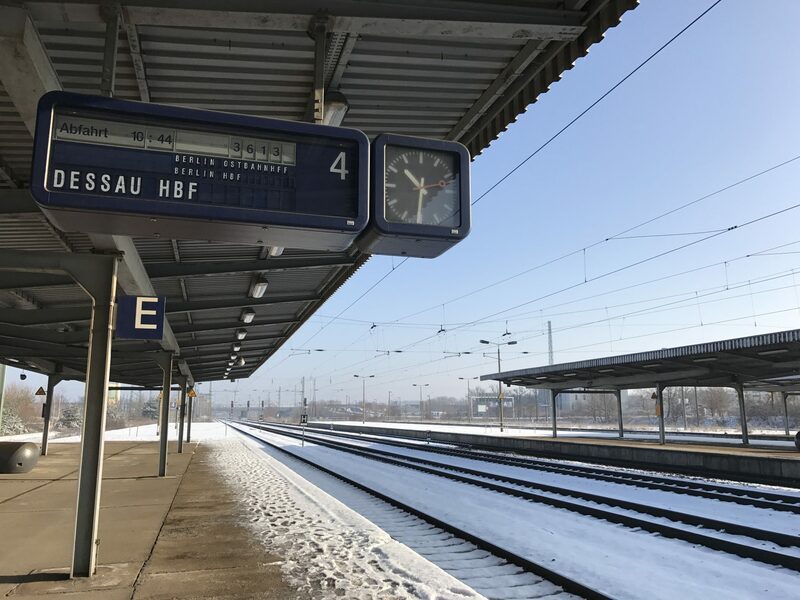 After picking up my ticket, I headed to Schonefeld’s train station. I had a 25 minute wait on the platform. Does this look cold? No? My ‘phone said it was -4 but it felt like -20. A biting wind whistled along the platform and right through my jacket for the next 25 minutes. I was delighted when the train eventually pulled up! Around 45 minutes later, I arrived at Berlin Zoologischer Garten station, and strolled for around five minutes to get to my hotel. Thankfully my room was available, and I headed straight in and right in to a hot shower. It was bliss! I love the hotel, and my room is ace, but I’ll have to write about that another day, as I didn’t have time to get any photos, as I had a 1pm appointment. 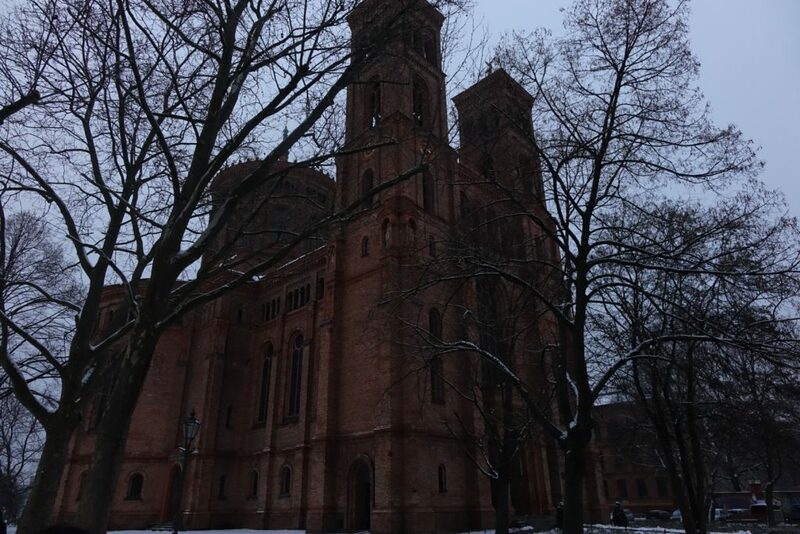 I’d planned to take a tour on my first day in Berlin to help me get my bearings, but I soon discovered there aren’t many tours that run on a Thursday in the winter months. I’d booked a food tour which was cancelled as the guide had a family emergency, and a bike tour I’d signed up didn’t get enough people. I did find one tour running though which sounded pretty interesting. 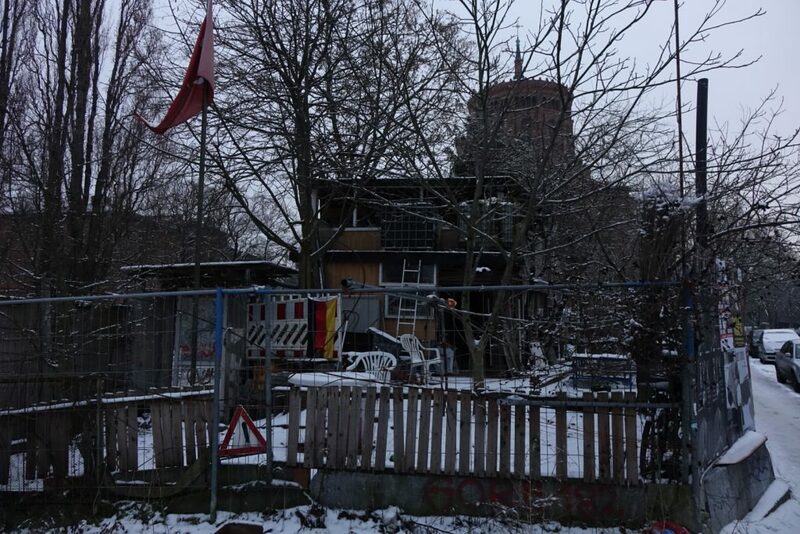 As I’d be doing all the tourist sites tomorrow, I didn’t really want to see them all on my first day, so I signed up for Alternative Berlin‘s free tour (you just tip what you feel is due) which said it explored alternative and underground cultures in the city. It sounded like a good way to see things I might not otherwise get to. I rushed back on the train, and arrived at Alexanderplatz just ten minutes before the tour was due to leave. I was starving, but the options in the train station were limited. 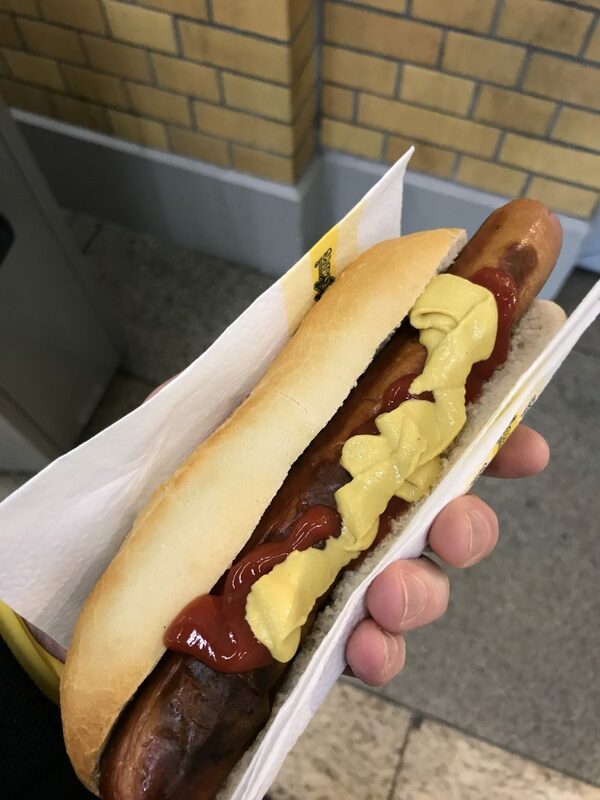 Eventually I decided to just try a Berlin speciality – currywurst. Using my best German (“Currywurst bitte”) I ordered one, and here’s what I got. I’m no expert right but that is NOT currywurst! That sauce (mustard and ketchup) I actually put on myself. So I basically got a dry hot dog. With no time to argue I just scoffed it down and headed off to meet up with the tour group. Soon we were off traipsing through that chilling wind and down a Mitte side street as our guide told us about some of Berlin’s street artists and pointed out their work. Some of them very topical! 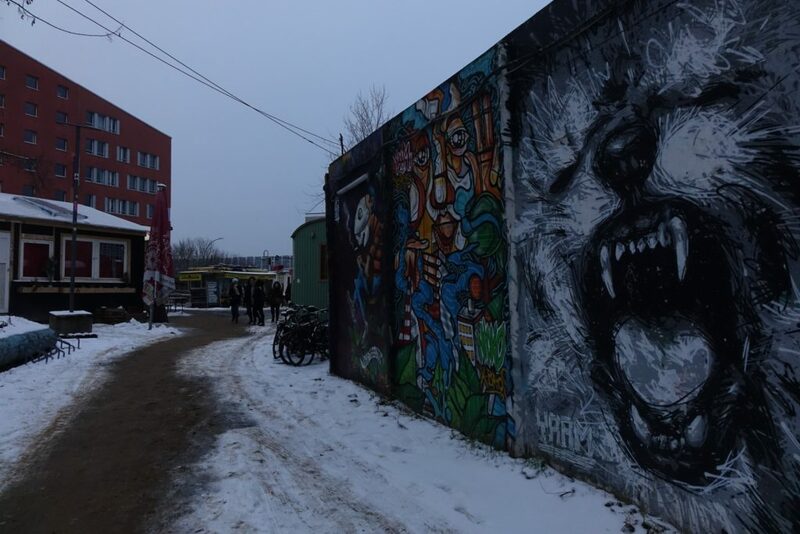 It was all interesting – and our guide explained the different kinds of art seen around Berlin’s streets, but it was SOOO cold I was having trouble concentrating. My teeth were chattering, my arms shivering – it was that cold. And we were only half an hour into a three hour tour! 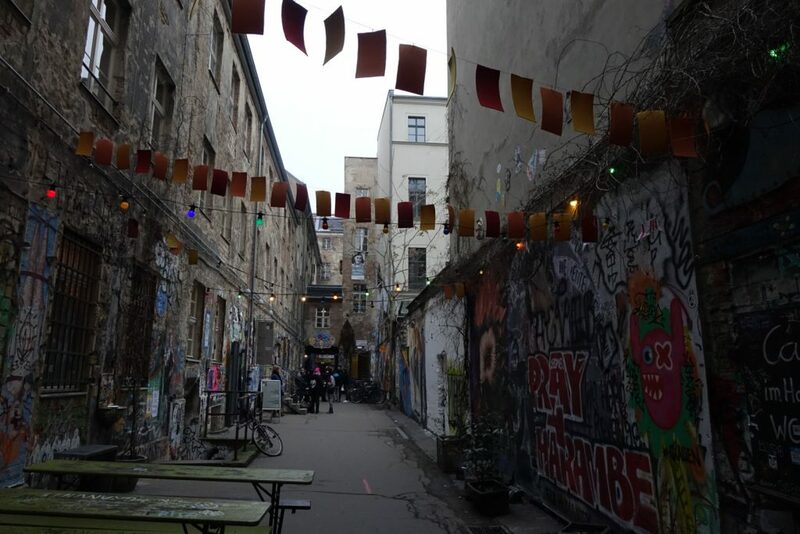 After a wander down an art-covered street, our next stop was an alley full of street art in Hackescher Markt. There was loads of it! Some were permanent, others were constantly being replaced with pieces that are sometimes commissioned and paid for too. The lane’s home to an Anne Frank museum, and another one about the life of a Jewish Berliner, but we didn’t have time to go into those. Some of the art was really pretty incredible. Off that alley, there’s apparently graffiti covered staircases and a bookshop and so on to explore, but we didn’t have time to go wandering. 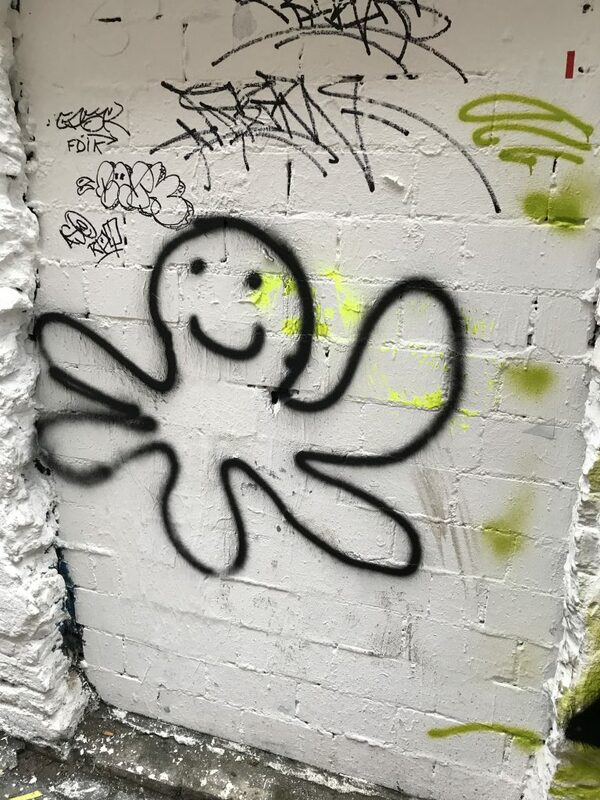 My personal favourite piece of art in this alley was this one. Simple but smiley. Hiya! 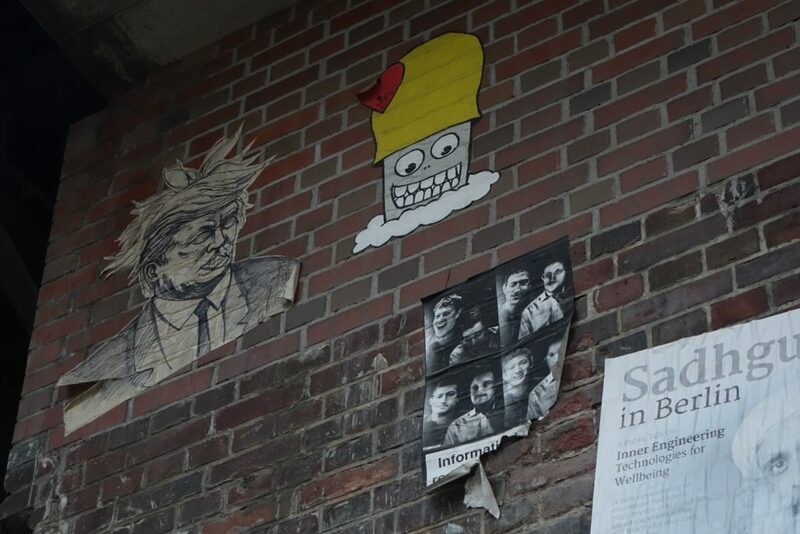 Next, we caught an underground train and headed to Kreuzberg – a part of Berlin that was once mainly home to immigrants and is now apparently up-and-coming. We saw a couple of famous pieces of street art – including this one. (Below not above!) 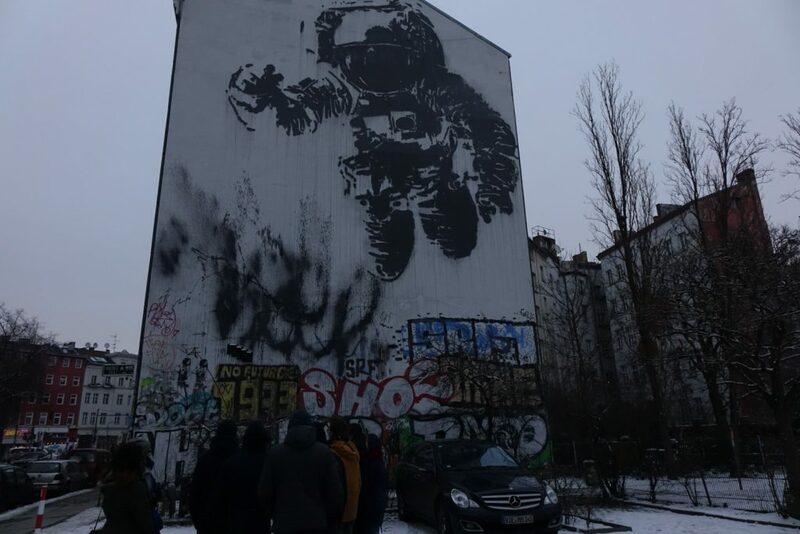 Created in 2007, the Cosmonaut mural is thought to be the largest stencil drawing in the world. We then headed off to see a couple of sights in the area as our guide filled us in on what Berlin’s like to live in as a city, and how it’s changing. I thought this church we passed was pretty spectacular. Standing looking at it was probably my low point in terms of feeling the cold. I felt ready just to lie down and submit to it! Thankfully (and through no fault of our guide, more to do with the cold), our tour was coming to an end. We saw a treehouse created by a Turkish man, Osman Kalin. He created it on a bit of land that actually fell in East Berlin when the wall was built – but because the East Germans took a shortcut building the wall to avoid a bend, the land was actually on the West German side of the wall. So it was a bit of no-man’s land really. Fed up with seeing rubbish discarded there, he built a treehouse instead! And though he’s in his 90s now, apparently he’s a bit of a Berlin institution. 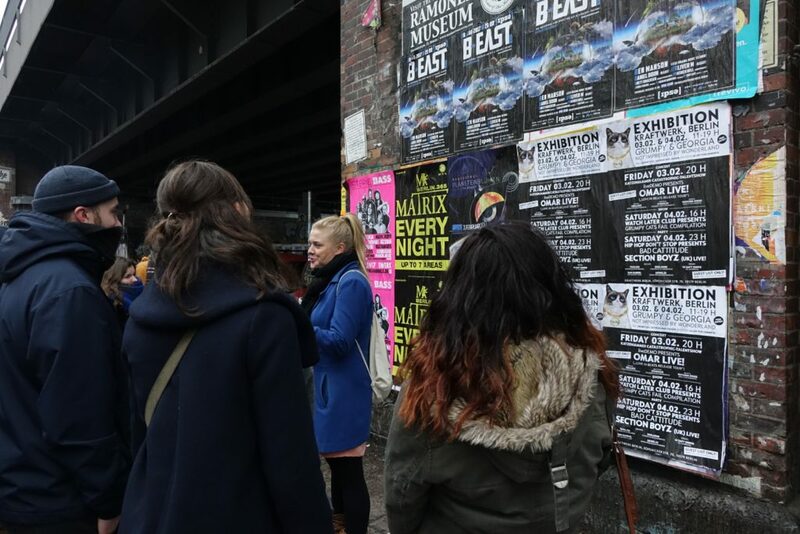 Stopping by the river, we saw an area currently occupied by artists, but which the city is keen to develop under a project called Media Spree. 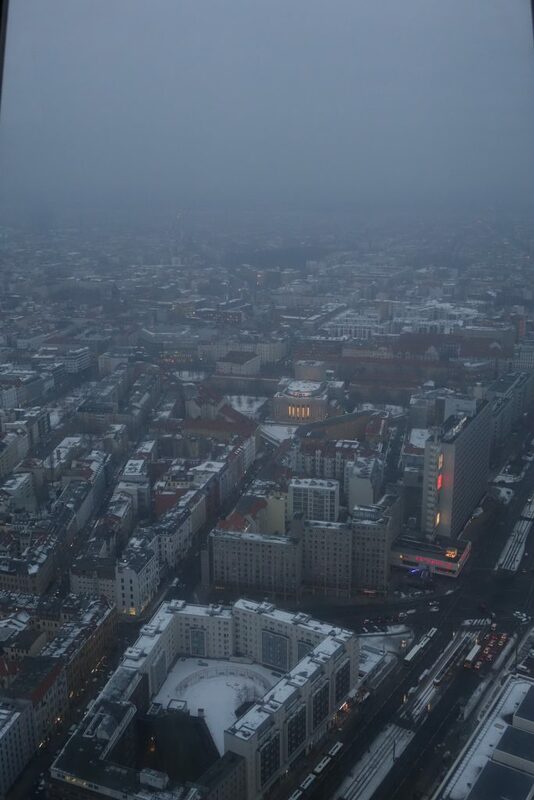 There was a great view of Berlin’s TV tower. We had one last stop – the Young and African Arts Market. YAAM for short, it hosts a beach in the summer, but unfortunately on this cold winter’s day it was pretty quiet. I think the tour would be great in the summer – but being absolutely honest I just found the cold a constant distraction. All I could think about was trying another technique to warm up, so I felt I didn’t really take in as much as I could have on the tour. We all said our goodbyes, I tipped the guide, and headed off to the nearest train station in search of warmth. And food, as by now I was ravenous. Then I came across some very strange toilets as I was searching for the nearest convenience (you wouldn’t get THIS on any other blog would you!) Check this out. Now is it just me or do those bubbles not make it look like laundrette? 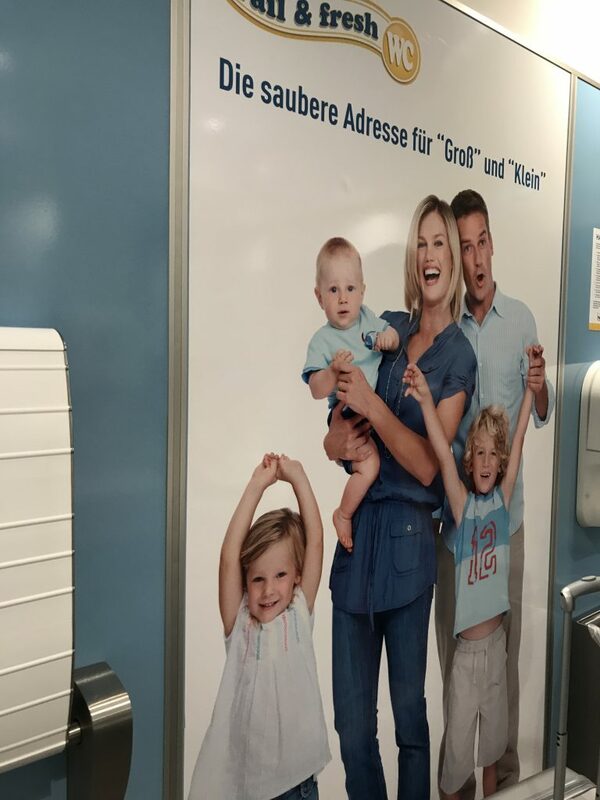 Inside was full of pictures of smiling German families like this. Just weird I thought! 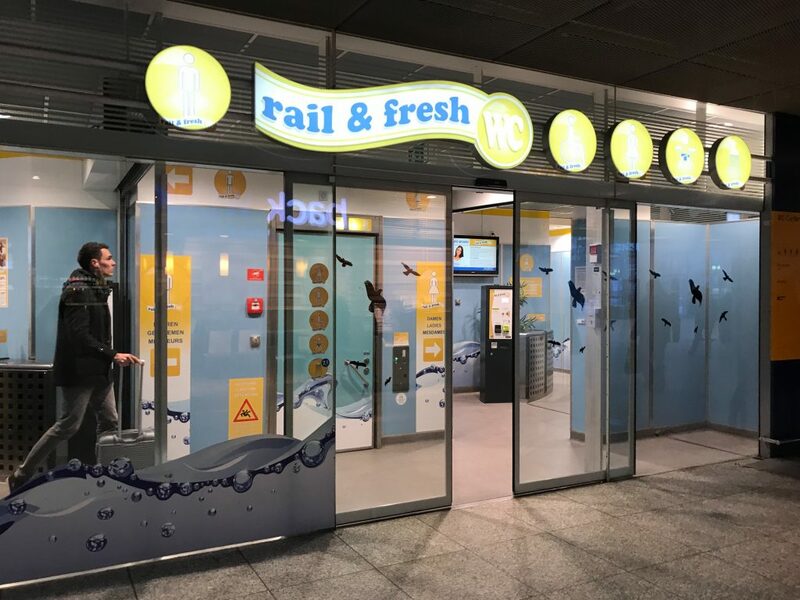 You paid one euro to get in, but that gave you a 50 cent voucher to spend in participating restaurants in railway stations. Which was also a bit weird. Anyway, after pondering this unique lavatorial this setup for a couple of minutes, I caught a train back to where the tour had started – Alexanderplatz. 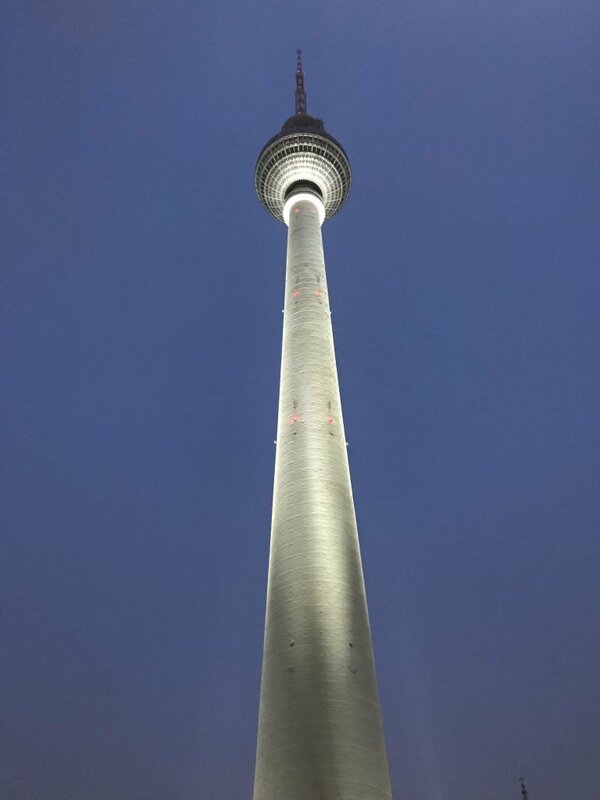 I was heading up the TV tower I’d seen earlier – or the Berlin Fernsehturm to give it its German name. It’s tall. 368 metres tall to be precise. Built by the East Germans (or GDR) in the late 1960s, it’s the tallest structure in Germany, and the second tallest in the EU (thanks Wikipedia). Apparently it’s usually recommended to reserve a ticket in advance, but I walked right up to the ticket counter without the need to queue – although it was about 4.45pm by this point. And I saved 25% off the 13 euro entrance fee with my Welcome Card hooray! 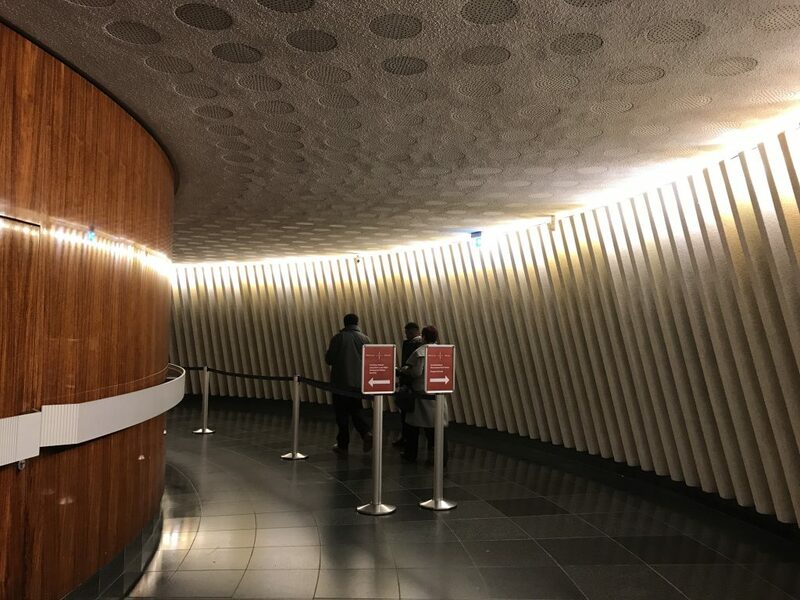 After going through an airport-type bag scan and metal detector, I arrived in the lift foyer, which looked like it had been untouched since the late 1960s, which I loved. It actually reminded me a bit of the sadly departed BBC Television Centre. We went straight in the lift, which had a cool glass ceiling so you could see how quickly you were going up the lift shaft (thankfully not a glass bottom). At the top, again, it looked like it had only been spruced up slightly since the Sixties. 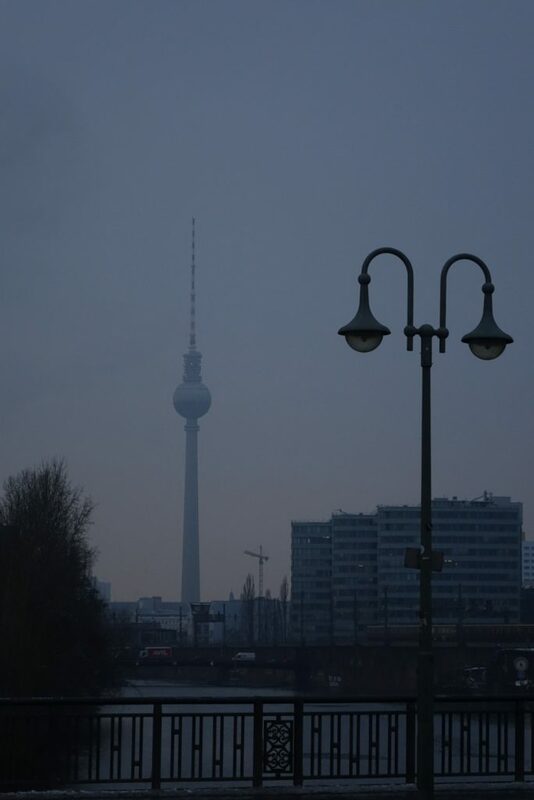 Sadly because of fog, the views weren’t that great, but I could still make out some Berlin landmarks, and kind of get an idea of where things were in relation to each other. All around the windows were signs pointing out certain landmarks, and telling you about them, but it was a bit frustrating that loads of people chose to use the signs as seats, so if you saw a weird looking building and wanted to find out what it was, tough luck if someone was sitting on its description! I spent about half an hour gazing at the view and reading what I could, before heading back down in the lift. Apparently the tower was going to be demolished at some point after the two sections of the city were reunited, but I’m glad it wasn’t – it’s such a well-known landmark now it was cool to go up it. By now, I was beginning to flag a bit due to my early start, but I had one more thing I wanted to do today. I headed back to the hotel for a quick shower to warm up, then jumped back on a train headed for Görlitzer station. 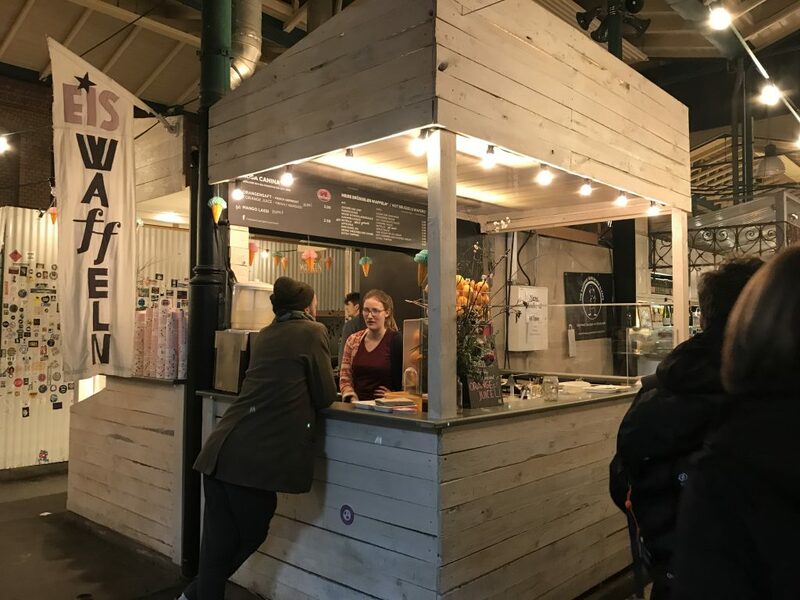 I’d read about Street Food Thursday before I left Belfast, and as a bit of a foodie, was determined to check it out. 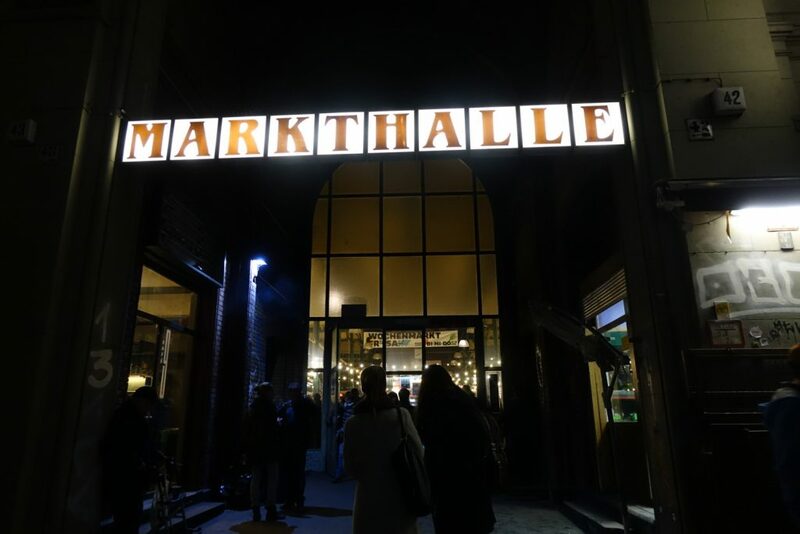 It’s where a load of street food vendors come together at Markthalle Neun – Berlin’s food market – and is held every Thursday from 5pm onwards. After tip-toeing through a park covered in sheet ice, I arrived at the market, and it was pretty obvious already from the people milling outside that the event’s a popular one. I headed inside- it was lovely and warm, and busy – with people sitting drinking, eating and chatting. I liked it! I’d say there must have been about at least forty different stalls selling everything from kitchenware to cheese, with fish and meat counters too, and a bit weirdly I thought an Aldi supermarket. I think some of the stalls were probably just there for the street food event, but others seemed to be more permanent and were offering bites to eat too. 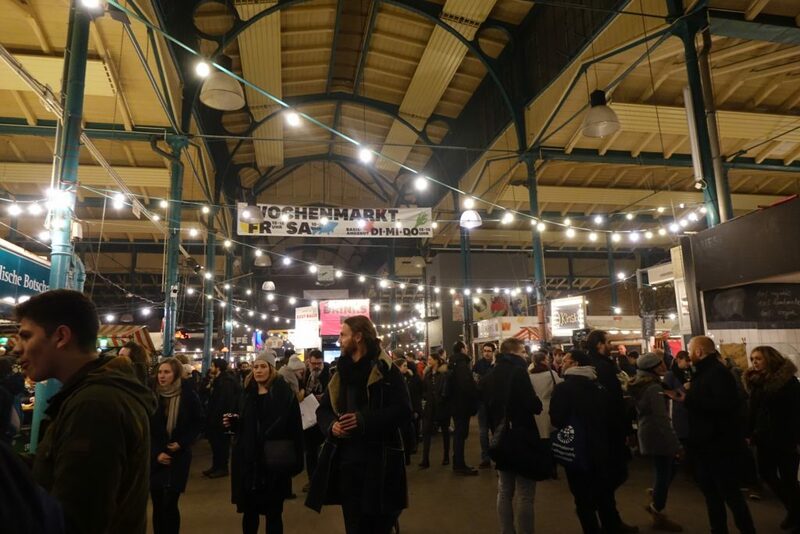 I wandered around just soaking up the atmosphere, and checking all the stalls out before deciding what to try. I was really, really hungry (I blame the cold), so I actually ended up eating my own body weight in food. First up was a Korean style steamed bun – I’d never actually tried one before, so I reckoned now was as good a time as any to give it a go! It came with kimchee, honey BBQ beef, cucumber, red onion and a spicy sauce that gave it a good bit of kick. 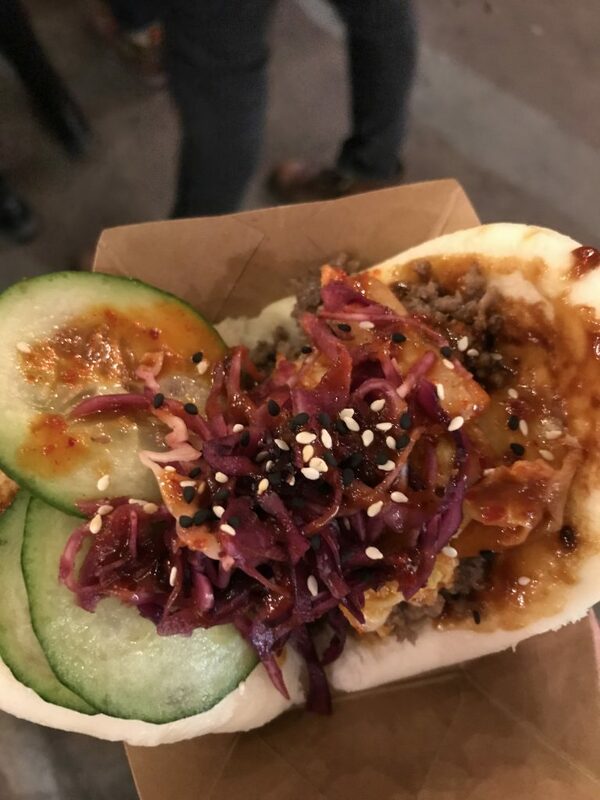 It was amazing – the bun was really soft, but the kimchi and cucumber added a nice crunchy bite. I was tempted to have another, but decided to move on and try something else. 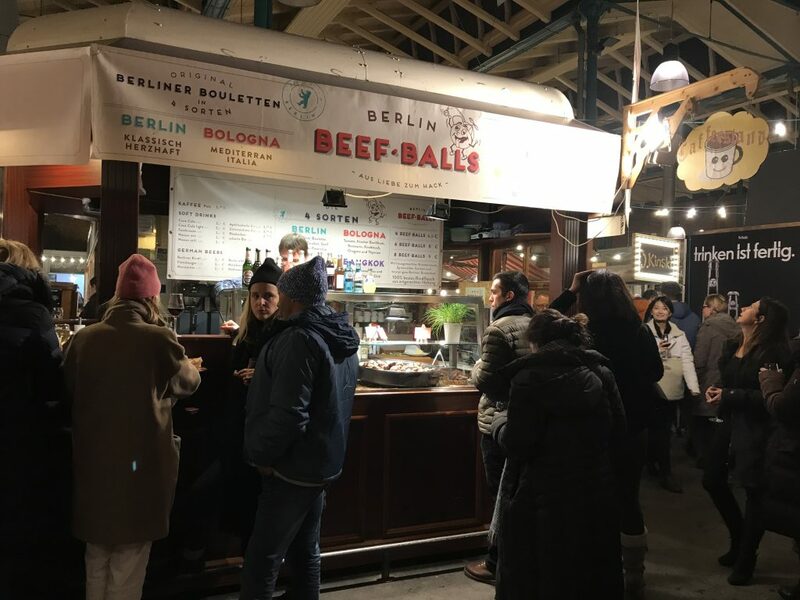 After a day not exactly filled with sampling German cuisine, I decided to try something that maybe approached it – from the Berlin Beef-Balls stand. For six euros fifty, you got four meatballs. 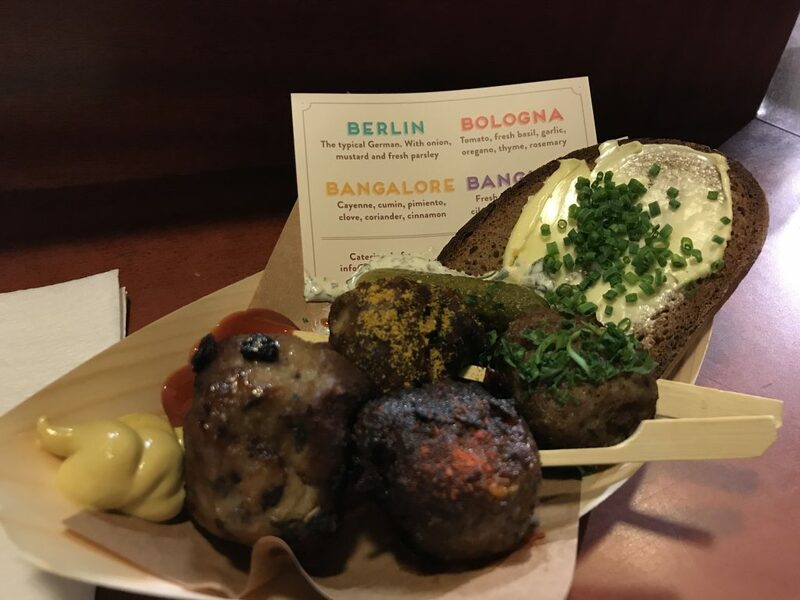 I tried one of each of the four different ones available – Berlin (flavored with parsley and mustard), Bologna (with basil, oregano and rosemary), Bangok (coriander, lemongrass and chill) and Bangalore (cumin, clove, coriander and cinnamon). And…. they were OK really. Every time I took a bite of a different one I thought “Ooh that’s the Indian one”. So I really couldn’t tell which was which. I thought it was pretty pricy for what you got. 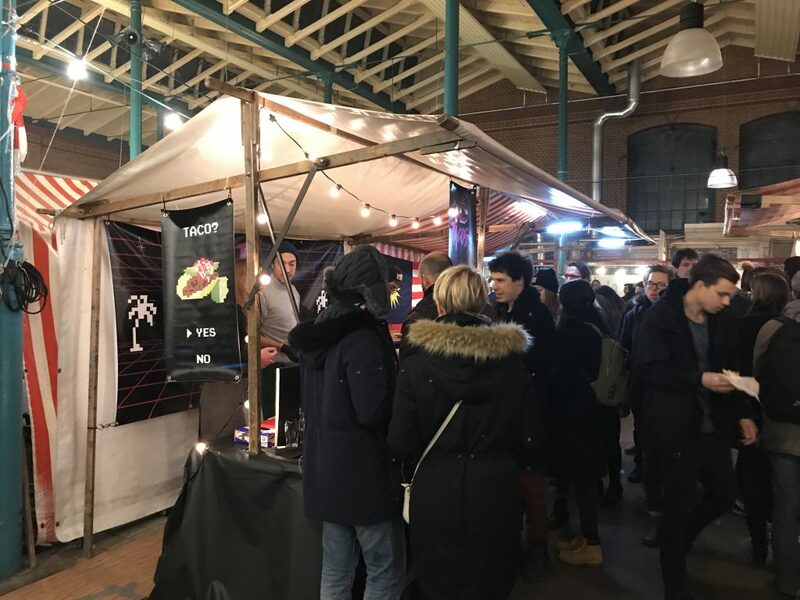 Next I headed to the stall with what had definitely the biggest queue – one of two taco stands. The queue was so long it actually stretched right in front of a stall selling Chinese food – I felt a bit sorry for them! 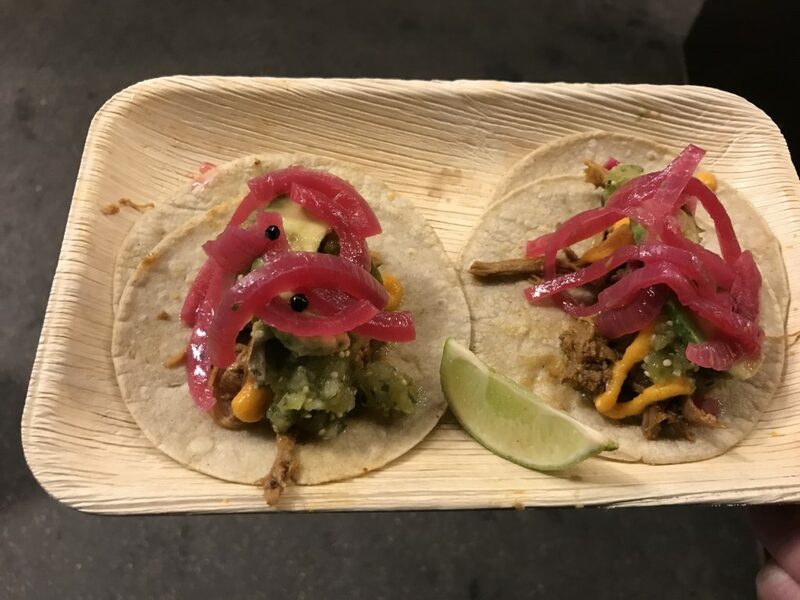 I had two tacos with pulled pork, avocado, pickled red onion and salsa verde. 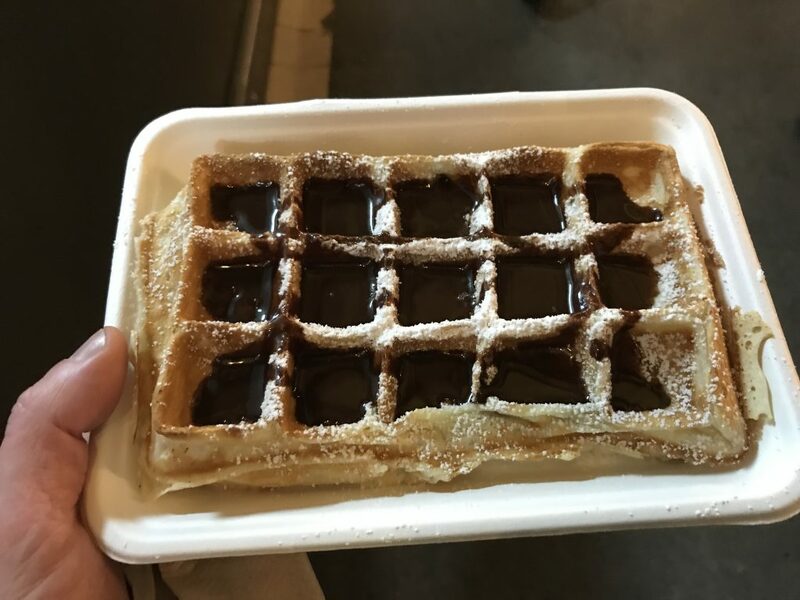 …for a waffle with hot chocolate sauce. It had a bit more sauce on it than I expected. Yes I ate the whole thing. Warm sugary goodness! 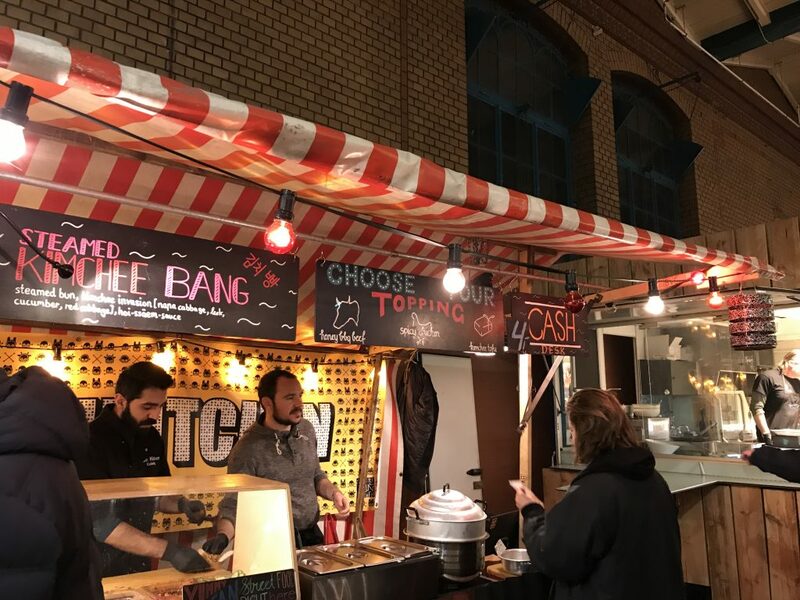 If you’re in Berlin on a Thursday, I’d definitely recommend heading down to Street Food Thursday. It was the perfect way to round off my first day in the city. 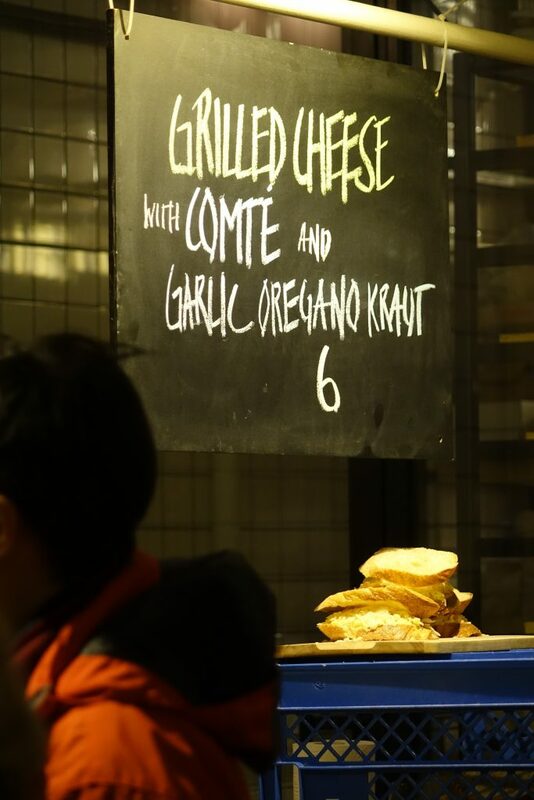 There’s an amazing range of food available – even a simple thing like cheese on toast looked amazing! Suitably stuffed, I left the market behind and caught a train back to my hotel. 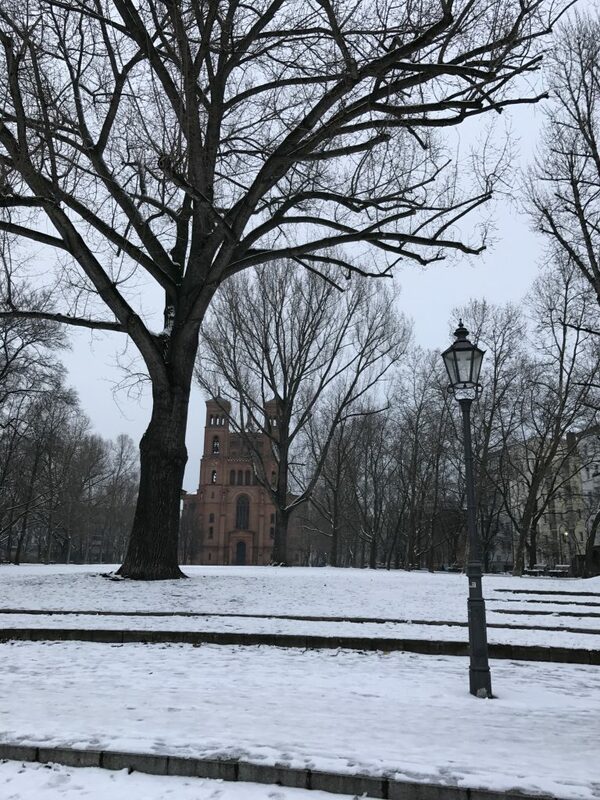 I’d had a great but chilly day in Berlin, but needed to be up early in the morning for another appointment – and a day exploring the city’s better known landmarks. My posts may be a bit erratic over the next couple of days as I’m struggling to find the time to write them up up, but if I don’t get them done while I’m actually away, I will do it when I get back.